1CU Shah University, Wadhwan, India. Due to long Indian coastal line of 7517 Km India is more vulnerable to coastal flood, soil erosion, tropical cyclone, Tsunami. In India every year five or six tropical cyclones are form in Bay of Bengal and strike the east coast of India. Out of this two or three cyclones could be severe and more hazardous to human life. Cyclones occur frequently on both the coasts (The west coast Arabian SeaÃÂ¾ and the east coast Bay of Bengal). More cyclones occur in the Bay of Bengal than in the Arabian Sea and the ratio is approximately 4: 1.In India, Tropical cyclones occur in the months of May-June and October- November. The cyclones of severe intensity and frequency in the north Indian Ocean are bimodal in character, with their primary peak in November and secondary peak in May. The disaster potential is particularly high at the time of landfall in the north Indian Ocean (Bay of Bengal and the Arabian Sea) due to the accompanying destructive wind, storm surges and torrential rainfall. Of these, storm surges are the greatest killers of a cyclone, by which sea water inundates low lying areas of coastal regions and causes heavy floods, erodes beaches and embankments, destroys vegetation and reduces soil fertility. In this research paper we are discussing formation of cyclones and its parameters. How GIS and remote sensing is beneficial before and after cyclone to reduce causalities and damage of life and property. A cyclone is a low pressure area in the atmosphere in which winds spiral upward .Cyclones are designed from simple thunderstorms. However, these thunderstorms can only produce to cyclone strength with help from both the ocean and the atmosphere. First of all, the ocean water itself must be warmer than a threshold say, 28 °C. The heat and moisture from this warm water is the source of energy for cyclones. Cyclones will weaken rapidly when they travel over land or colder ocean waters — locations where their heat and/or moisture sources do not exist. High relative humidity in the lower and middle troposphere is also required for cyclone development. This high humidity’s reduce the amount of evaporation in clouds and maximize the latent heat released because there is more precipitation . Cyclones are categorized by: (1) low pressure at the centre, and (2) winds spiraling toward the centre. The rotation of tropical cyclones in the Northern Hemisphere is counter-clockwise and clock-wise in the Southern Hemisphere due to Coriolis Effect. The size of a tropical cyclone over the north Indian seas varies from 50-100 km radius to 2000 km with an average of 300–600 km . Tropical cyclones strongest wind speeds are generally located about 1500 feet above the surface and the strength of the wind falls both above and below that level. However, it remains strong enough at the surface to be able to cause considerable damage. The vertical wind shear in a tropical cyclones environment is also important. Wind shear is defined as the amount of change in the wind’s direction or speed with increasing altitude. When the wind shear is weak, the storms that are part of the cyclone grow vertically, and the latent heat from condensation is released into the air directly above the storm, helping in development. When there is stronger wind shear, the storms become more slanted and the latent heat release is dispersed over a much larger area . Tropical cyclones can be compared to heat engine, as they draw energy from the ocean for their formation. Tall convective towers of clouds are formed within the storm as warm ocean water evaporates. As the air rises higher it cools and condenses releasing latent heat which causes even more clouds to form and feed the storm. Cyclones are characterized as tornadoes, hurricanes and typhoons. A tornado is a smaller kind of cyclone. When a cyclone forms over tropical waters in the North Atlantic or eastern North Pacific oceans and has winds of 119 km/hr or more it is called a Hurric ane. If the cyclone forms in the western Pacific with winds of 119 km/hr or more it is called a Typhoon. All of these storms are generally accompanied by high winds, heavy rains, severe thunder, and lightening. In the north Indian Ocean they are simply called as tropical cyclones. The word cyclone has been derived from Greek word ‘cyclos’ which means ‘coiling of a snake’. The word cyclone was coined by Henry Paddington, President of the marine courts, and Kolkata during British rule in 1848. To him, the air flow in association with cyclone resembled the coils of a snake and the name which is very much supported by the present day satellite cloud imagery and radar echoes, with their spiral bands interspersed with gaps . Cyclones can often live for a long period of time — as much as two to three weeks. They may initiate as a cluster of thunderstorms over the tropical ocean waters. Once a disturbance has become a tropical depression, the amount of time it takes to achieve the next stage, tropical storm, can take as little as half a day up to a couple of days. The same may occur for the amount of time a tropical storm needs to intensify into a cyclone. Atmospheric and oceanic conditions play the major role in determining these events. The four stages shown below represent a continuous process for cyclone. Individual stages may even occur more than once during the life-cycle of a particular storm. To describe both the earliest stages of the life-cycle and progression to a mature hurricane or typhoon. In this stage, the Tropical Cyclone central pressure falls and the maximum surface wind speed increases. An eye may develop at the center of the TC if the stage continues. The mature stage of a TC is usually associated with the period in which the TC reaches maximum intensity. The central pressure has reached a minimum, and the surface winds have reached a maximum. When a TC decays, the central pressure increases and the maximum surface winds weaken. Usually, the decay in process is the result of a TC moving over land, moving over cool water, recurving and assuming extra tropical characteristics, or a combination of these processes. Even though the TC is decaying, it can produce high winds and heavy rains. 2. Large values of low level relative vorticity. 3. Coriolis parameter (minimum of at least 500 km away from the equator). Without the Coriolis force, the low pressure of the disturbance cannot be maintained. 4. Weak vertical wind shear (less than 10 ms-1). High vertical wind shear will weaken the cyclone. 5. High Sea surface temperature (greater than 26°C) and deep thermocline. 6. Conditional instability through a deep atmospheric layer. 7. Large values of relative humidity in the middle and lower troposphere. There are two distinct cyclone seasons- one in the pre-monsoon, during the hot summer from April to June and other is postmonsoon, from October to December. The percentages of occurrence of storms during pre and post monsoon seasons are 28% and 61% respectively. Tropical cyclones developing during the monsoon months (July to September) are generally not so intense. Low pressure area Wind speed less than 31 km/h. Depression Wind speed between 31 and 61 km/h. Cyclonic storm Wind speed between 62 and 88 km/h. Severe cyclonic storm Wind speed between 89 and 118 km/h. with a core of hurricane winds. Very severe cyclonic storm Wind speed 119 and 221 km/h. Super cyclonic storm Wind speed above 222 km/h. Table 1: Classification of tropical disturbances in the Indian Ocean as per IMD. The average annual frequency of tropical cyclones in the north Indian Ocean (Bay of Bengal and Arabian Sea) is about 5 (about 5-6% of the Global annual average) and about 80 cyclones form around the globe in a year. The frequency is more in the Bay of Bengal than in the Arabian Sea, the ratio being 4:1. The monthly frequency of tropical cyclones in the north Indian Ocean display a bi-modal characteristic with a primary peak in November and secondary peak in May. The months of May-June and October-November are known to produce cyclones of severe intensity. Tropical cyclones developing during the monsoon months (July to September) are generally not so intense. The frequencies of Cyclonic systems over north Indian Ocean during 1891-2006 are given in Figure 1 below. Figure 1: The frequencies of Cyclonic systems over north Indian Ocean during 1891-2006. The frequencies of cyclonic storms crossing different coastal states of India during 1891-2006 are shown in Figure 2 below. The frequency of severe cyclonic storms is maximum for Andhra Pradesh while that of cyclone is maximum for Orissa. Considering west coast only, Gujarat is most vulnerable. 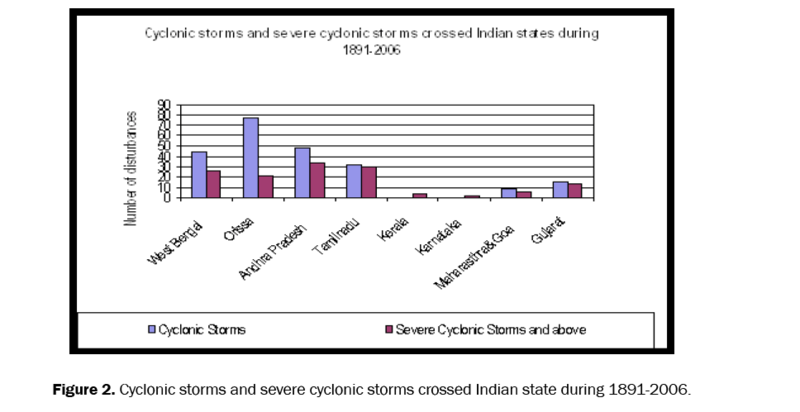 Figure 2: Cyclonic storms and severe cyclonic storms crossed Indian state during 1891-2006. Figure 3: Intensity of a Cyclone. Upper Tropospheric Anticyclones - As viewed by satellites (and satellite cloud-tracked winds and water-vapour-tracked winds), upper-troposphere circulation patterns associated with intensification are the easiest to identify because the upper troposphere clouds usually obscure shallower clouds. These upper-troposphere patterns can define the outflow at the top of the TC, which indicates mass removal from the canter of the storm (Figure 1). (2) Tropical Upper Tropospheric Trough--A strong upper level (250-200 hPa) cyclonic circulation to the north or northwest of a TC, namely the tropical upper tropospheric trough (TUTT or TUTT Cell), is a common occurrence during July and August in the northern Pacific. This type of upper-level circulation pattern is favorable for vigorous outflow to the north. In addition, this pattern generally occurs as the cyclone nears the western edge of the subtropical ridge where enhanced equator ward outflow is common. The combined effects of the northward and southward outflow often lead to rapid deepening. It has been recognized that the Sea Surface Temperature (SST) is one of the most important parameters which plays a significant role in the cyclogenesis). Palmen showed that tropical cyclones do not form over the area where SSTs are below 26ºC. The heat and moisture from the warm water is ultimately the source of energy for cyclones. Cyclones will weaken rapidly when they travel over land or colder ocean waters; locations where supplemental heat and/or moisture sources do not exist. After the passage of the cyclone, SSTs reduce due to cyclone induced mixing and cooling. Robert found a relationship between SST and minimum sea level pressure at the storm centre. Ali showed that the maximum intensity of a tropical cyclone is more sensitive to warmer SST. Ali showed that SST over the Atlantic region could determine the upper boundary 14 of cyclone intensity and he developed an empirical relationship between SST and maximum sustained wind speed for Atlantic hurricanes . Though SST plays an important role in cyclogenesis, it has been shown that the upper ocean heat content, called as Tropical Cyclone Heat Potential (TCHP) play a more important role in tropical cyclone intensity changes When the storm strengthens, the wind caused by the storm induces more stress on the upper ocean. As a result of this, there is a strong turbulent mixing across the base of the oceanic mixed layer and upwelling of the thermo cline due to net wind driven current transport away from the storm centre These shear induced mixing effects deepen and cool the oceanic mixed layer as cooler water is entrained from the thermo cline. This process causes mixed layer temperature to decrease, weakening the storm by limiting 15 the air-sea fluxes. This negative feedback mechanism is effective when the mixed layer depth is shallow or when the storm remains stationary for few days . It has been observed that tropical cyclone forms only in the regions of large positive low level troposphere relative vorticity. Larger this vortices, the greater appear potential for cyclogenesis. The vorticity fields, derived from the European Centre for Medium-Range Weather Forecasts (ECMWF) were used to forecast tropical cyclone movement and intensity changes. Tropical cyclones form only in the region where the mid tropospheric relative humidity (RH) is above 40% as moist air in the middle troposphere is more conducive to deep convection and vertical coupling of the atmosphere . The influence of earth's rotation, called Coriolis Effect has primary importance in tropical cyclone formation. Initial storm latitude position (ISL) is the indicator of the magnitude of Coriolis force. Storm Motion Speed (SMS) has been considered as one of the significant parameters in predicting the cyclone intensity. It is positively correlated with intensity as slow moving storm shows slow intensification owing to reduction in sea surface temperature when the storm moves slowly or remains stationary in a place. These effects can be quite complex. In general, a TC that moves over land decays. A TC decays much faster when it passes over mountainous regions, such as Taiwan or Luzon, than it does over flat land. Also, a TC often re-intensifies when it re-enters a marine area . A TC that enters into the mid-latitudes either decays rapidly or transforms into an extra tropical cyclone. A decaying TC may still produce heavy rain, especially when it moves over mountainous areas. When a transformation from TC to extra tropical cyclone occurs, forecast responsibility is transferred from the TC forecast centre to another forecast office. While a threshold SST is required for the cyclogenesis, oceanic heat content plays a prominent role in the intensification or dissipation of the cyclones. Initial Storm Intensity and Previous Change in Intensity in 12 hours. As initial storm intensity and intensity changes during the previous 12 hrs indicate the future rate of intensification, these parameters assume significance in the statistical cyclone intensity prediction models. The radar can be utilized to find out the location of the cyclonic storm more accurately when the system comes within radar range. In addition it can find out convective cloud cluster, wind distribution, rainfall rate etc. A network of conventional Cyclone Detection Radars (CDRs) has been established at Kolkata, Para dip, Visakhapatnam, Machilipatnam, Chennai and Karaikal along the east coast and Goa, Cochin, Mumbai and Bhuj along the west coast. These conventional radars are being phased out and replaced by Doppler Weather Radars (DWRs). Doppler Weather Radar (DWRs) which provide vital information on radial velocity from which wind field of a tropical disturbance in the reconnaissance area of DWR can be derived. In addition to above, a number of derived parameters useful for cyclone monitoring and prediction are also available from DWR.DWR have already been installed and made operational at Chennai, Kolkata, Visakhapatnam and Machilipatnam. An indigenously developed DWR Radar by Indian Space Research Organization (ISRO) has been installed at Sriharikota . • Methods based on climatology, persistence and both Climatology & Persistence (CLIPER). • Synoptic Techniques – Empirical Techniques. • Statistical Techniques using climatology, persistence and synoptic. • Numerical weather prediction models. Numerical weather prediction models used operationally for Tropical Cyclone track Prediction and storm surges in IMD. • T-254 model of NCMRWF, MM5 mesoscale model. • Quasi-Lagrangian Limited Area Model (QLM) for track prediction. • Weather Research and Forecast (WRF) mesoscale model for intensification and track prediction. • Prediction Models of IIT – Delhi and NIOT Chennai for Storm Surge Prediction. In addition to above, IMD forecasters make use of various forecasts available from international NWP models like BCBCMRF, UKMET and COLA etc . Indian Meteorological Department (IMD) is authorized to monitor and give warnings regarding Tropical Cyclone (TC). Data resources are crucial to early forecasting of cyclones. Satellite based observations are being extensively utilized. Satellite integrated automated weather stations have been installed on islands, oilrigs and exposed coastal sites. Buoys for supplementing the surface data network in the tropical ocean have been deployed. The Government has also started a National Data Buoy Programme. A set of 12 moored buoys have been deployed in the northern Indian Ocean to provide meteorological and oceanographic data. Dynamic forecasting of TCs requires knowledge of the vertical structure of both the Cyclone and the surrounding environment. The goal of any warning system is to maximize the number of people who take appropriate and timely action for the safety of life and property. All warning systems start with detection of the event and with people getting out of harm’s way. Such warning systems encompass three equally important elements namely; Detection and Warning; Communication and Response . The second stage of “Cyclone Alert” is sounded 48 hours in advance of the expected commencement of adverse weather over the coastal areas. Forecasts of commencement of strong winds, heavy precipitation along the coast in association with arrival of cyclone are issued at the alert stage. Landfall point is usually not identified at this stage. The third stage warning known as “Cyclone Warning” is issued 24 hours in advance. Landfall point is forecast in this stage of cyclone warning. In addition to the forecasts for heavy rains and strong winds, the storm surge forecast is also issued. Since the storm surge is the biggest killer so far as the devastating attributes of a storm are concerned, information in this regard is most critical for taking follow up action for evacuation from the low lying areas likely to be affected by the storm. Search, rescue and evacuation procedures are carried out immediately after disaster strikes a certain area. These are major operations, usually performed by local volunteers, voluntary organizations and district and state agencies. The basic aim of all such operations is to ensure the survival of the maximum possible number of victims. A plan is worked out with the help of local people through aerial surveys and appropriate steps are then taken by the various teams involved to carry out the operations. Besides bringing material relief, the aim is also to control panic and confusion and to provide moral support . During cyclone, Remote sensing data provide timely and detailed information that are required by the authorities to locate and identify the affected areas and to implement corresponding damage mitigation. It is essential that information be accurate and timely, in order to address emergency situations i.e. dealing with diversion of inundated water, evacuation, rescue, resettlement, water pollution, health hazards and handling the interruption of utilities etc. Some important spatial outputs produced and analyzed in real time. The disaster extent maps, real time monitoring by remote sensing data and of damage to buildings and infrastructure maps were prepared. Moreover, meteorological reports based on real-time remote sensing data are required to show intensity/estimates, movement and expected duration of rainfall for the next 3 hours . In this stage, re-building of destroyed/damaged facilities and adjustments of the existing infrastructure will occur. The time factor is not as critical as in the last stage. Nevertheless, both medium and high-resolution remote sensing images, together with an operational geographic information system, can help to plan many tasks. The medium resolution data can establish the extent of the damages whereas high-resolution data are suitable for pinpointing locations and the 56 degree of damages. They can also be used as reference maps to rebuild bridges, washed-out roads, homes and other facilities. India Meteorological Department (IMD) is deliver operational cyclone forecast to Bangladesh, India, Maldives, Myanmar, Pakistan, Sri Lanka, Sultanate of Oman and Thailand. INSAT imagery is used to identify and locate the various stages of the cyclone and to estimate the intensity and position using objective Dvorak Technique. The Dvorak technique is based on the examination of cloud patterns in visible and infrared imagery. 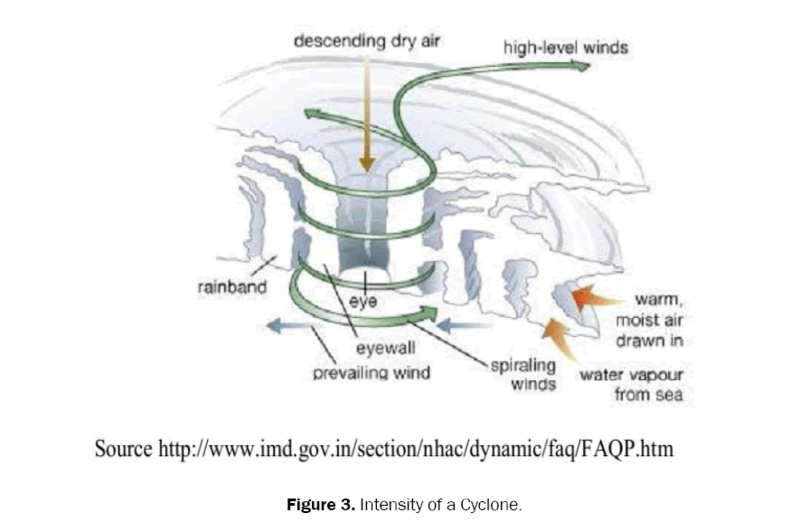 The cloud patterns obtained from INSAT for the Orissa Super Cyclone is shown in Figure 4 wherein the eye of the cyclone is clearly seen. A quasi-lagrangian model (QLM) is used by IMD for cyclone track prediction. The model provides track forecast up to 72 hours in advance. 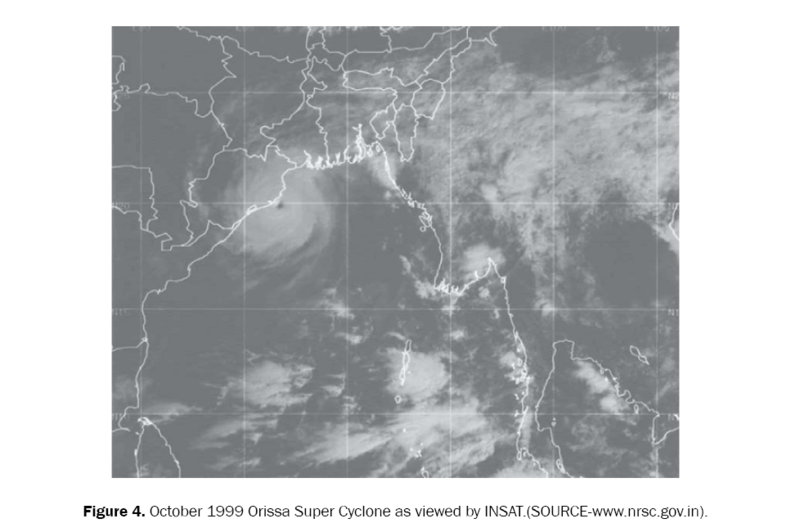 Figure 4: October 1999 Orissa Super Cyclone as viewed by INSAT.(SOURCE-www.nrsc.gov.in). Operational cyclone forecasts are also available from Joint Typhoon Warning Centre (JTWC), US Department of Defence, Hawaii, USA, though these forecasts are primarily meant for the US government agencies. Although not an official member or participant in the United Nations World Meteorological Organization (WMO), JTWC continually attempts to maintain cordial relations with WMO tropical cyclone forecast centres to minimize the issuance of conflicting information. JTWC monitors, analyzes, and forecasts tropical cyclone genesis, development, and movement across more than 110 million square miles of the Pacific and Indian Oceans from the west coast of the Americas to the east coast of Africa. This area of responsibility encompasses more than 90% of the world’s tropical cyclone activity . JTWC uses the 1-minute mean wind speed to determine maximum sustained surface winds, as required by the US National Hurricane Operations Plan. Other countries, however, use the 10-minute mean wind speed to determine maximum sustained surface wind speeds. The difference generally means that JTWC will report higher maximum sustained surface wind speeds than non-US. TCWCs for the same cyclone. Besides the forecasts out to 120 hours, JTWC provides historical data on its site . From the current cyclone season, National Remote Sensing Centre (NRSC) has initiated the prediction of cyclones in the Arabian Sea and the Bay of Bengal, primarily; for the Disaster Support Centre of I S RO. Soft-computing techniques developed at SAC and NRSC are being used for the purpose .NRSC also plays a major role in cyclone damage assessment using Indian Remote Sensing Satellites and Radar sat data. An example of the damage assessment created usingIRS-1C and Radar sat data due to the Orissa Super Cyclone is given in Figure 5. 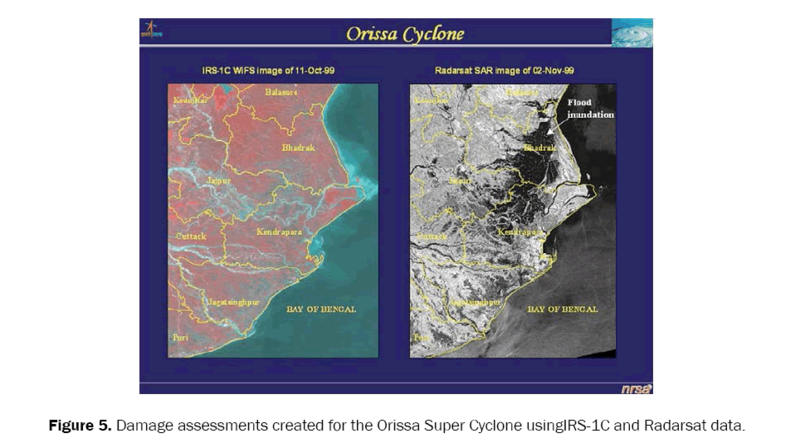 Figure 5: Damage assessments created for the Orissa Super Cyclone usingIRS-1C and Radarsat data. Tropical cyclones are one of the catastrophic natural disasters that affect many countries around the globe, causing considerable loss of human lives, Agricultural loss, and loss of property in coastal areas. The life span of the tropical cyclones is measured in days or weeks. No other atmospheric disturbance combines duration, size and violence more destructively than tropical cyclones. Remote sensing and GIS inputs are useful and used to save innocent lives and for impact assessment to infrastructure and properties. Remote sensing and GIS are used operationally for early warning and monitoring of Tropical cyclones also it help to disaster managers for damage assessment and relief operations. This paper has provided information related to production of tropical cyclones and use of remote sensing, satellite technology, GIS is used to reduce impact of disaster. Dhruvesh KM. Role of Remote Sensing and GIS in Cyclone. Journal of Pure Applied and Industrial Physics. 2016;6:116-127. Special Daily Weather Report. 2016. Ali MM, et al. Effects of Eddies on bay of Bengal Cyclone Intensity. Earth Observation Systems 1988;93-95. Robert H. Hurricanes: A Primer on Formation, Structure, Intensity Change and Frequency. The Marshall Institute - Science for Better Public Policy. 2006. Henderson-Sellers A, et al. Tropical Cyclones and Global Climate Change: A Post-IPCC Assessment. American Meterological society. 1998. Palmen E. On the formation of & structure of Tropical cyclones. Geo Physics. 1948;3:26-38. Johnny CLC and Jeffrey D Kepert. Global perspective of Tropical Cyclones. 2010. Murphy AH. Climatology, Persistence, and Their Linear Combination as Standards of Reference in Skill Scores. American Meterological Society. 1992. Murphy, Allan H. Climatology, Persistence, and Their Linear Combination as Standards of Reference in Skill Scores. Weather and Forecasting. 1992;7:692-698. Dasgupta R. Disaster Management and Rehabilitation. Mittal Publications. 2007. Ashok KS and Varun J. Use of remote sensing and GIS in disaster management in Gangtok area, Sikkim. Geospatial World. 2010. Agola NO and Awange JL. Globalized Poverty and Environment: 21st Century Challenges and Innovative Solutions. Springer Science & Business Media. 2014.